Behold my first attempt at creating a center-pull ball without the handy winder. I spent most of Saturday spinning the blue silk roving while sitting in on an all-day seminar, and the last thing I thought I would do was finish it. And, what do you know, I finished it after all. A good hour before the end of the seminar. I had brought along another roving, and my drop spindle, but I didn’t want to try using the drop spindle because I was tired. The silk was between me and spinning time, so, I used the shaft of my drop spindle as an impromptu ball winder and spent the whole rest of my time there making this. And, once I got home, I realized that I’m going to have to carefully unwind that whole ball onto two thread cones. 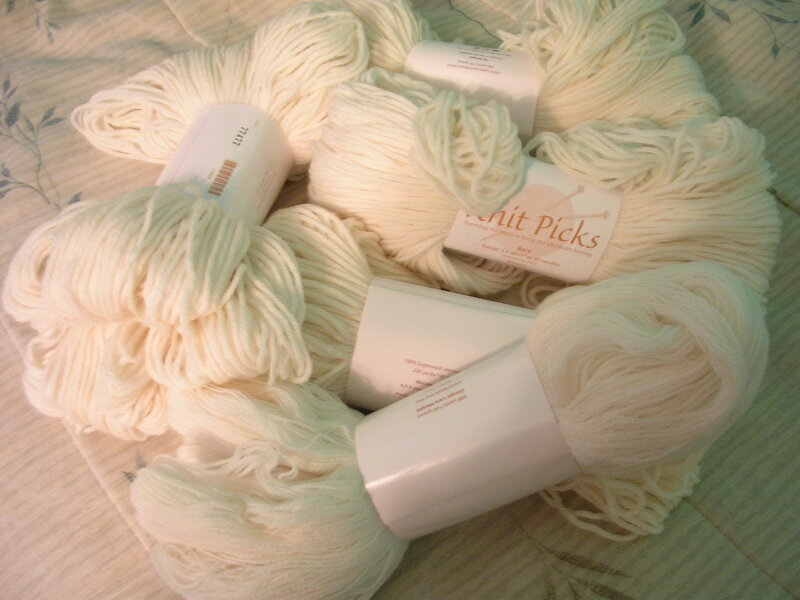 If you do center pull with silk, the silk tends to collapse as you pull yarn out of the middle, resulting in tangles. I knew that, I just forgot it. It’s going to be a bit of a hassle, but I’m hoping the love of the colors will motivate me. 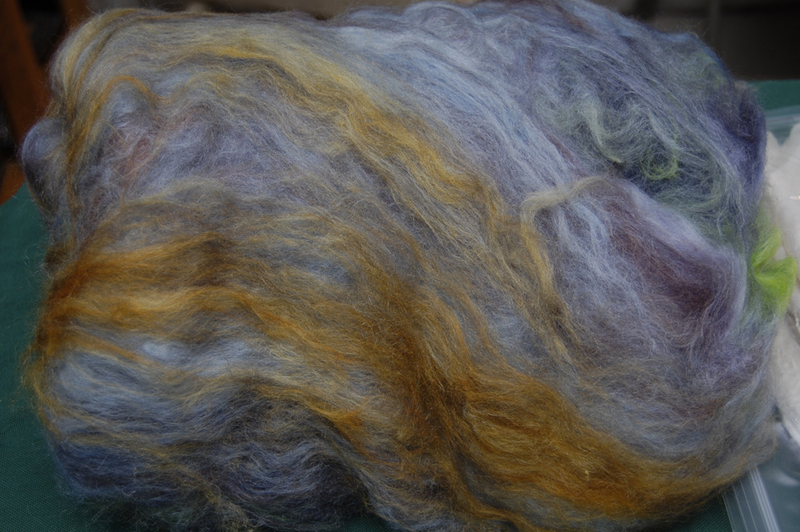 The fall-colored fleece has scored pretty high on my “favorite self-dyed fluff” list. The camera turned the red a little magenta-y, but it’s pretty true. I can hardly wait to start carding it! Hurry up and dry! I’m thinking I will separate the colors when I card it to try to maintain relatively clear color shifts. In fact, I may play around with how I put the fiber on the carders. I’m almost wishing I had dyed more fleece when I did, although I only dyed one of the silk hankies—and in order to keep the right silk-to-wool ratio, I had to use just twice as much wool as silk. Which meant two ounces of wool. So, come to think of it, I bet I did way more anyway. Dyeing both hankies would have been the simplest route to take, but I didn’t want to risk ruining both hankies if something went wrong. I got to play with the teal and periwinkle dyes. They became some rather nice samples, and I learned to not try to microwave-set a yard of yarn in a small glass jar with a whole teaspoon of dye solution by sticking it in the microwave for a minute. Good thing it was superwash. Although it seems to have gotten fatter for some odd reason. Boiling must take off the superwash coating. The darker strand is the boiled one. The one on the bottom is actually some of the Rebecca yarn, which I popped into the very hot, leftover dye water from the boiled superwash. Can you see how the yarn almost looks like it’s glowing? It took me a bit to figure out why it was doing that. I think it’s because I just dunked the yarn in, gave it a couple seconds in the hot water, and pulled it out. 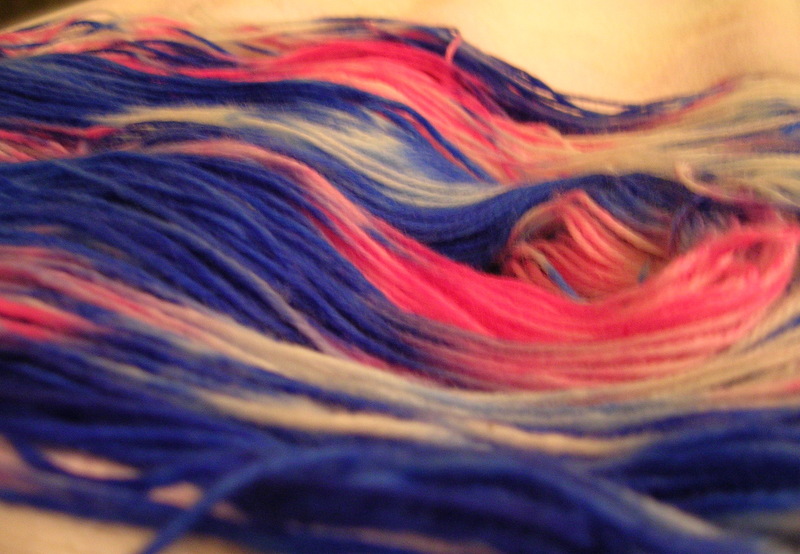 The outer fuzzies dyed blue, but the core of the yarn is still cream. 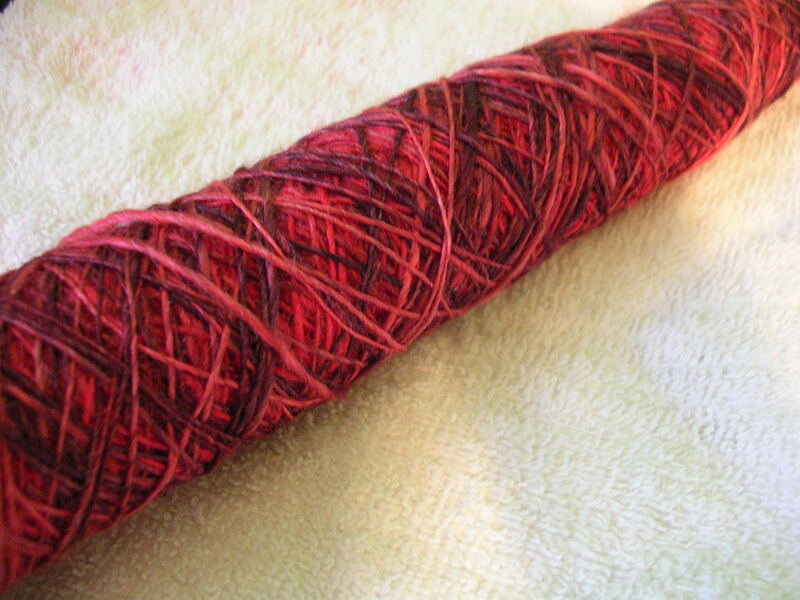 I may have to experiment with double-dyed yarns in the near future. Here’s a little dyeing that snuck in under the radar. Four and a half ounces of who-know-what wool roving. It had a distinctive yellow-golden color before dyeing. And thick! Oh my. The dye barely penetrated the whole batch, even after I pre-soaked it for at least a half hour. 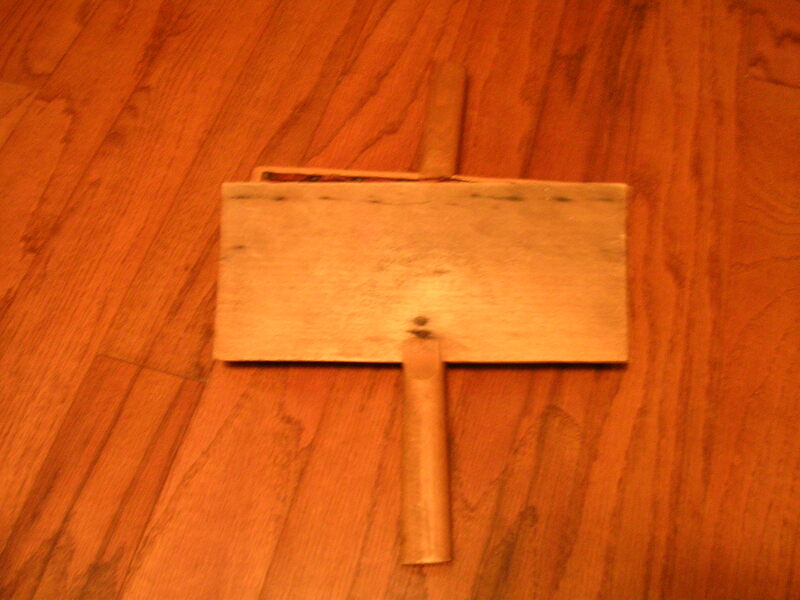 It was dyed using only Crimson and Chestnut. When it first came out of the pot it looked really pink in some areas, but either something happened or it grew on me, because it looks redder now. Look what arrived in the mail! A pile of yarn skeins eagerly waiting to see what color they’ll become. The possibilities are endless. That’s two skeins of merino worsted weight, a skein of merino lace weight, a skein of superwash merino DK weight, and a skein of superwash merino worsted weight. Fun fun fun! I’m eager to try out some new color combinations. The colors turned out much brighter than I thought it would, but I like it. This was made using the colors Sky Blue and Pink. We got the yarn at The Yarn Garden. A very nice shop. Then I wanted to do the wool in brown, tan, cream, and turquoise.